The god Blue Moon has deserted the world and plunged it into chaos. Blue Moon City is in ruins and its people have fallen into open war. Multiple factions seek to appease Blue Moon and hasten his return by currying the favor of the three dragons of elemental power. In the ruins of the great city, the ingenious Hoax seek to dominate through their mechanical inventions, while deep below ground, the fiery Vulca wield the molten force of the heart of the world. On the craggy mountaintops, the birdlike Flit watch the struggle unblinkingly, waiting for the right moment to make their move. And in the secret heart of the forest, the beautiful but wild Mimix sharpen their spears. In Blue Moon you take control over one of the peoples of the world Blue Moon. Your aim is to attract the three elemental dragons in direct confrontation against one of the other peoples. To achieve this goal, each round one of your characters is sent to fight against one of your opponentâ€˜s characters. Each people has various sources of support and boosters available, to finally enforce the enemy to withdraw and, by doing so, to attract one or more dragons. As the leader of your people you can also intervene directly. The basic game contains the "Hoaxâ€œ and the "Vulcaâ€œ. Two seperate sets will also be available: The "Mimixâ€œ and the "Flitâ€œ. More seperate people sets are currently in preparation: "Terrahâ€œ, "Aquaâ€œ, "Pillarâ€œ and "Khindâ€œ. You decide which people you want to play and are ready to confront any other people instantly. 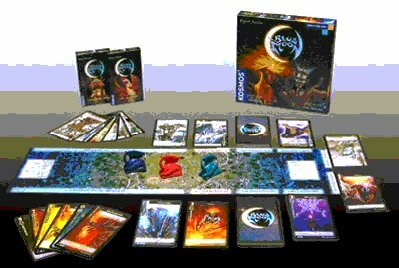 Blue Moon is not a trading card game, each people set is complete and ready to play. There are no rare, hard to get, extreme powerful cards, but Blue Moon is still a very flexible game system. Special rules for advanced players are already included that allow players to use cards of other peoples with their chosen people. Every card has a printed value (moons). Both players are allowed to use cards of other peoples than the chosen one with a sum not higher than 10 moons in addition to their own people. Every set already contains a small number of cards of different peoples, so these rules are already implemented and used in the already available sets. Fairly quick moving, back-and-forth, tug-of-war-feeling game. You choose a race to play with, use your characters and supplemental cards to fight a series of skirmishes against a single opponent. The vastly different, but balanced, races (decks) make this game very interesting. It is simple, but the combination of special abilities, bluffing and pushing your luck makes it strangely addictive. Plays fast too. Before Blue Moon I had never played any sort of card dueling game. Plus, my wife hates confrontational games. Yet, somehow, we both enjoy playing this. The battles are fast and rarely does one person win every one. The basic set is good because the Vulca are very easy to figure out while the Hoax reward more complex thinking. Fast playing game that emulates some of the strategy of a CCG but in a much easier to stomach form. Lots to do with bluffing, counters, and trying to get your opponent to over/under commit to a battle.